Description: Chromolithograph print, signed Mosnar Yendis. 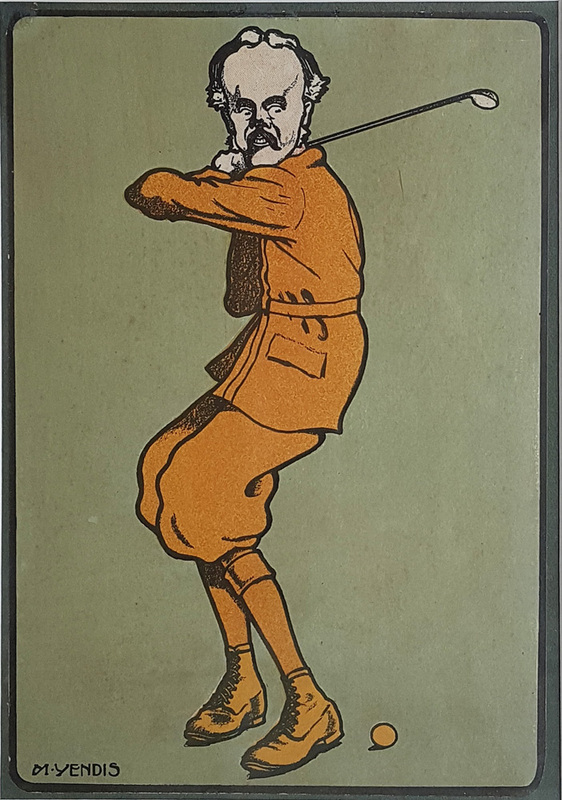 Art Nouveau style cartoon of a golfer swinging his club. Condition: Good bold image, laid on card as published. aka Mosnar Yendis (Sidney Ransom spelled backwards). A poster and book illustrator in the Art Nouveau style who was working in the late Victorian era. Published works in the magazine " The Poster, An Illustrator Monthly Chronicle', by David Allen an Sons, London c. 1900. Ransom also authored and illustrated the children's book, The Great Red Frog in 1903. Published an illustration in The Sketch in 1902 entitled "Brighton between the Seasons". Other poster titles illustrated by Ransom include, 'The Enemy of Man' and 'The Sins of the Fathers'.